Every Korean who has experienced the Asian Financial Crisis of 1997 remembers the sharp depreciation of the Korean won. In October 1997, just before the crisis, one U.S. dollar was trading at about 915 Korean won. However, by December 1997, the same dollar had more than doubled. Due to this dramatic depreciation of the won, many Korean companies suffered greatly from the sudden spike in the prices of essential imported goods, such as minerals and petroleum products. Similarly, following the global economic meltdown in 2008, the Korean won once again depreciated significantly, albeit to a lesser extent than in 1997. This time, a large number of export-oriented Korean firms faced another dilemma: Knock-In, Knock-Out (“KIKO”) currency option contracts that they signed onto in 2006 and 2007 when the value of the won was on the rise. After the wide fluctuations during the Asian Financial Crisis, the exchange rate finally stabilized at around 1,200 won per dollar until 2003. Subsequently, the rate appreciated steadily and it reached 950 won per dollar by 2006. To hedge against the risk of appreciation, many Korean export companies entered into KIKO currency option contracts. However, following the 2008 global financial crisis, the Korean won fell once more, leaving the KIKO buyers with huge financial losses and driving some to bankruptcy. In response, some of these companies sued the banks that sold the KIKO contracts. In many cases, Korean courts have invalidated the KIKO contracts. While this intervention can be justified as protecting a vital national interest—Korea’s export industry—such judicial refereeing also raises concerns that court-mandated paternalism overshadows the freedom of contract. Compared to standard currency options, KIKOs offer a substantially lower premium. A KIKO buyer gets the right to knock out: the right to sell dollars at a pre-arranged rate. Because exporting companies earn their revenues mostly in U.S. dollars, they need to shield themselves from the risk of dollar depreciation. A KIKO buyer can sell the dollars at the pre-arranged rate even if it is higher than the market rate. Conversely, a KIKO seller retains the right to knock in: the right to purchase dollars at another pre-arranged rate (often in knock-in rate itself) if it appreciates beyond the level specified in the contract. Under the knock-in option, a KIKO seller can potentially reap huge profits. It is this offhand chance at huge profits that creates the contract’s low premium. There are three possible scenarios under a KIKO contract. Suppose both the knock-in rate and the seller’s pre-arranged rate is ₩1,100/dollar, the knock-out rate is ₩900/dollar, and the buyer’s pre-arranged rate is ₩1,000/dollar. First, if the exchange rate falls below the ₩900/dollar within the contract period, the contract becomes invalid. Second, if the exchange rate is between ₩900 and ₩1,000/dollar at maturity, the buyer reaps the benefit by selling the dollar at ₩1,000/dollar—more than its market value. If the exchange rate is between ₩1,000 and ₩1,100/dollar at maturity, the buyer does not have to exercise his right to sell, and there would be no loss. Third, if the currency reaches the knock-in rate within the contract period, the buyer may end up losing or profiting depending on the market exchange rate at maturity. If the exchange rate at maturity is below ₩1,100/dollar, the seller would not exercise her right to buy at ₩1,100/dollar. However, if the exchange rate at maturity is above ₩1,100/dollar, the buyer suffers, because they are forced to sell at ₩1,100/dollar. From this structure, it is apparent that the buyer’s potential for gain is relatively small because it is confined to a range between ₩900 and ₩1,000/dollar. On the other hand, the window of potential liability is unlimited as anything above ₩1,100/dollar would likely spell doom for the buyer. The financial danger arises because there is often no limit to the amount of dollars that the seller can force sale of. Thus, the KIKO buyer first exhausts their dollar reserves, then must spend the won income to buy further dollars at the market rate—which is above the knock-in rate. This difference between the market and the knock-in rate is also what makes exercise of the option so appealing to the seller: they are in an arbitrage situation with their secure, below-market source of dollars. Since the Korean won was appreciating consistently at a slow pace from late 2004 to early 2006, many exporting companies expected to reap benefits under the second scenario, and thus rushed to sign KIKO contracts in 2006 and 2007. Against these expectations, the value of the dollar relative to the Korean won appreciated rapidly in 2008, reaching about ₩1,500/dollar. Having to sell dollars at a rate well below the market rate, the KIKO buyers faced huge losses. Although these firms still received won for their dollars, they lost up to 50% of their monetary value in the process. The buyers ultimately brought legal suits against the banks to invalidate the KIKO contracts. Many courts, including the Korean Supreme Court have invalidated KIKO contracts, in part because the KIKO-selling banks violated their fiduciary duties. The courts found that the banks did not fully explain the potential risks associated with the KIKO contracts, and only highlighted rosy scenarios. For example, Kim San In, the CEO of manufacturing company Hwaseong described a climate where “banks never, never notified us of these KIKO options’ high risks. . . . [T]hey said they were 99 percent sure the won would continue to rise.” Similar to the U.S. subprime mortgage crisis, these banks received commissions based on the quantity—rather than the quality—of contracts generated. The result was that Korea’s domestic banks had an incentive to sell as many KIKO contracts as possible without properly assessing any risks themselves. IV. Unwarranted Paternalism or Justifiable Policing? Is such outright judicial intervention desirable? For courts to step in, they step on the freedom of contract. Freedom of contract is a practical principle that is the inevitable counterpart of a free enterprise system because respecting individual contracts safeguards the exchange of goods and services on the free market. Public policy requires “that men of full age and competent understanding shall have the utmost liberty of contracting, and that their contracts when entered into freely and voluntarily shall be held sacred and shall be enforced.” Hence, there is a presumption for enforcing contracts between private parties unless the evidence clearly suggests that the content of the agreement is so one sided as to be unconscionable. Defining the parameters of unconscionability, though, is a daunting task. For instance, how does a court differentiate between lawful market pressure and unfair coercion? Since principled line drawing poses such a thorny problem, court-enforced protection should remain a remedy of last-resort in extreme cases. Yet, the KIKO buyers themselves are far from innocent. Most were small to mid-sized companies, and low KIKO premiums allowed these firms to realize short-term gains. In addition, the problems of herd mentality and moral hazard were prevalent. Many companies entered into KIKO contracts merely because their competitors were also signing such contracts. 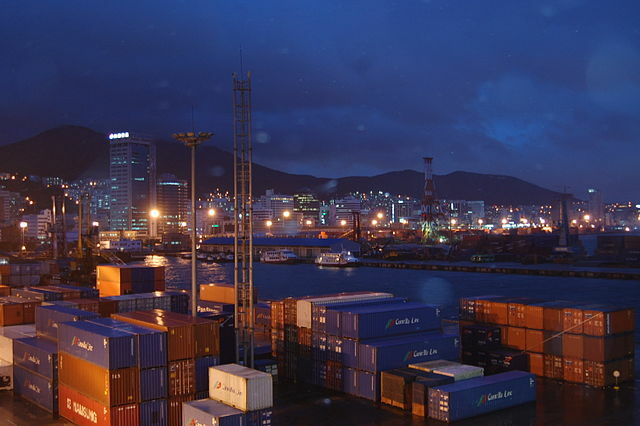 Given the importance of exports in Korea and the prevalence of KIKO contracts among exporting companies, many companies bet on the chance of government bailout. Some even entered into multiple contracts with different banks without justifiable reasons, and others bought KIKO’s for amounts that exceeded their projected overseas income. Despite the disproportionate potentials for loss and gain, the relative values of consideration in contracts between businesses dealing at arms’ length transactions should not affect the validity of contracts. It would be an uphill battle for many export companies to demonstrate that they are the victims of unconscionable contracts because they understand the inherent risks associated with the foreign exchange market, and they regularly deal with both domestic and international financial institutions. The companies freely and voluntarily entered into KIKOs. Both sides seemingly got what they wanted, at least up until the 2008 global financial crisis. Thus, paternalistic concerns seem to be driving the Korean courts to jettison the basic principle of honoring private agreements among parties. This coddling, protectionist result is undesirable—and perhaps dangerous—because it both reinforces corporate dependency on Korea’s government and potentially opens the floodgates of litigation over private contracts through the setting of a dangerous precedent. A new tool—national economic necessity—would be given to all exporters desirous of escaping onerous contracts. But hand-in-hand with this object is the policy argument in favor of the KIKO buyers. Korea is one of the world’s most trade-dependent nations, and as such the Korean government simply cannot stand idly and let its integral export industry collapse. However, this national necessity can also cut against judicial intervention. Upholding national prosperity is not the sole domain of the courts, and so perhaps other branches of government may take steps to solve the KIKO fiasco even in the absence of judicial intervention. Whether this trend of intervention will continue awaits an answer, given the profusion of KIKO cases still pending. Korean Judicial Invalidation of Knock-In, Knock-Out Currency Options, 2 Cornell Int’l L.J. Online 54 (2014). * Geary Choe is a J.D. Candidate at Cornell Law School. He holds a Master of International Studies from Seoul National University and a B.S. in Industrial and Labor Relations from Cornell University. See Federal Reserve Statistical Release: H.10 South Korea Historical Rates, http://www.federalreserve.gov/releases/h10/hist/dat96_ko.htm. Id. The dollar was trading at 1,960 Korean won. See Federal Reserve Statistical Release: H.10 Historical Rates for the South Korean Won, http://www.federalreserve.gov/releases/h10/hist/dat00_ko.htm. Id. This time, the rate peaked at 1,570 won on March 2, 2009. See Federal Reserve Statistical Release supra note 3. Yoolim Lee, Korean Corporations Court Bankruptcy With Suicidal KIKO Options, Bloomberg, (Mar. 24, 2009), http://www.bloomberg.com/apps/news?pid=20601109&sid=aDQ1pZabcyIo&refer=home. See Court Annuls Lenders’ KIKO Contracts, supra note 5. Ja-young Yoon, Losses from Currency Option Derivatives Rising, The Korea Times, (July 8, 2008), http://www.koreatimes.co.kr/www/news/biz/2008/07/123_27254.html. Korea Federation of Banks, The Understanding of KIKO (2009), http://www.kfb.or.kr/news/notice.html?S=EA&m=view&table=NOTICE5&fd=&sw=&pg=2&num=2065. Id. Note that the buyer’s potential benefit is limited because the buyer profits only when the current exchange rate falls between the knock-in and the knock-out rates. Id. In this scenario, the buyer will most likely lose. Once the exchange rate rises above the knock-in rate, it could potentially rise indefinitely, causing a huge loss to the buyer. See Federal Reserve Statistical Release, supra note 3. See The Understanding of KIKO, supra note 11; see also Lim, infra note 21(noting that at the aggregate level, the firms claim a total loss of 1.7 trillion won). See, e.g., Supreme Court [S. Ct.], 2011Da53683, 53690, Sept. 26, 2013 (S. Kor. 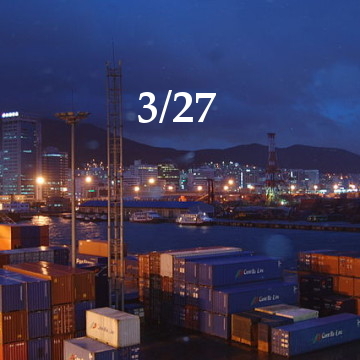 ); Seoul High Court [Seoul High Ct.], 2011Na11513, Feb. 6, 2013 (S. Kor.). Bomi Lim, `KIKO’ Hedges Slay Korean Exporters, Threaten Banks, Bloomberg, Oct. 17, 2008, http://www.bloomberg.com/apps/news?pid=20601109&refer=home&sid=aGUX1AEq1RUU. Robert S. Summer and Robert A. Hillman, Contract and Related Obligations: Theory, Doctrine, and Practice 579 (6th ed. 2011). Eun-jung Kim, Nobel Laureate Defends Victims of Controversial Currency Derivative, Yonhap News (Dec. 17, 2009), http://english.yonhapnews.co.kr/business/2009/12/17/27/0503000000AEN20091217007900315F.HTML. 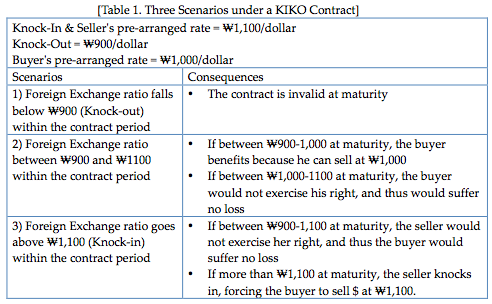 Haksoo Ko and William Moon, How Koreans Deal with Foreign Exchange Rate Risk: A Behavioral Law and Economics Perspective on the KIKO Forward Contract 3-4 (Seoul National University School of Law, 2011), available at http://papers.ssrn.com/sol3/papers.cfm?abstract_id=1937254. See Lee, supra note 8. See Marsh v. Lott, 97 P. 163, 165 (Cal. Dist. Ct. App. 1908) (refusing to measure value of consideration to assess adequacy). See also Kowal v. Day, 20 Cal. App. 3d 720, 727 (Cal. Ct. App. 1971) (“Any consideration, however small, has been held sufficient for an option contract.”). See Ko and Moon, supra note 28, at 11. Alan Heston, Robert Summers and Bettina Aten, Penn World Table Version 7.1, Center for International Comparisons of Production, Income and Prices at the University of Pennsylvania, Nov. 2012, https://pwt.sas.upenn.edu/php_site/pwt_index.php. Trade dependency ratio is usually calculated by dividing the sum of a year’s total exports and imports by that year’s GDP. Da-ye Kim, Banks Score Partial Victory in KIKO Suits, The Korea Times (Nov. 29, 2010), http://www.koreatimes.co.kr/www/news/biz/2010/11/123_77170.html. Previous Article FCPA Enforcement Against Foreign Companies: Does America Know Best?